Metabolic Complete is formulated with the most researched nutritional ingredients on the market today. Delivers the highest bio-available form of nutrients and anti-oxidants to support metabolic cell functions. The average person severely lacks beneficial amounts of antioxidants in their diet. Metabolic Complete gives you maximum protection from environmental 'Free Radicals' which can damage your bodies organs and cells. The average person severely lacks beneficial amounts of antioxidants in their diet. Metabolic Complete gives you maximum protection from environmental 'Free Radicals' which can damage your bodies organs and cells. The standardized 'White Pine Bark Extract' and 'Grapeseed Extract (OPC95+)' in Metabolic Complete have been shown to cross the blood brain barrier, bringing antioxidants to both your brain as well as the rest of your body. It is one of the highest antioxidant formulas available anywhere in the world. 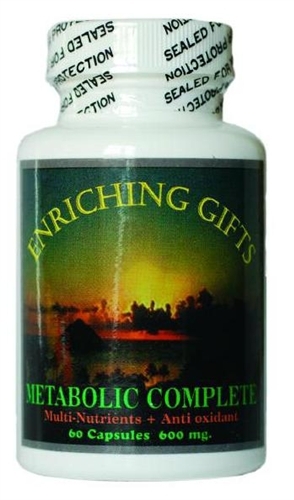 Metabolic Complete's primary use is for the protection of the body against free radical damage. This formulation is based on 2 time Nobel Prize winner Linus Pauling’s research. Metabolic Complete is formulated with the most researched nutritional ingredients on the market today, standardized to the highest possible potency. This unique and unparalleled formula delivers the highest bioavailable form of nutrients and anti-oxidants into the digestive system to support the vital metabolic cell functions of the body. These last two anti-oxidants are up to 50 times more potent than vitamin C and other related anti-oxidant sources. Free radicals, if unneutralized, damage the DNA of cells. MSM, essential for cellular function. Shark Cartilage, high in polysaccharides with analgesic properties. Cats Claw for healthy immune system functioning and whole food micro-nutrients to support metabolic activity that is impaired as a result of our modern day ‘fast food’ diets. damage the DNA of cells which can become weak, damaged and cancerous. MSM, essential for cellular function. Shark Cartilage, proven to be effective against cancer and high in polysaccharides and analgesic properties. Cats Claw for healthy immune system functioning and whole food micro-nutrients to support metabolic activity that is impaired as a result of our modern day ‘fast food’ diets.